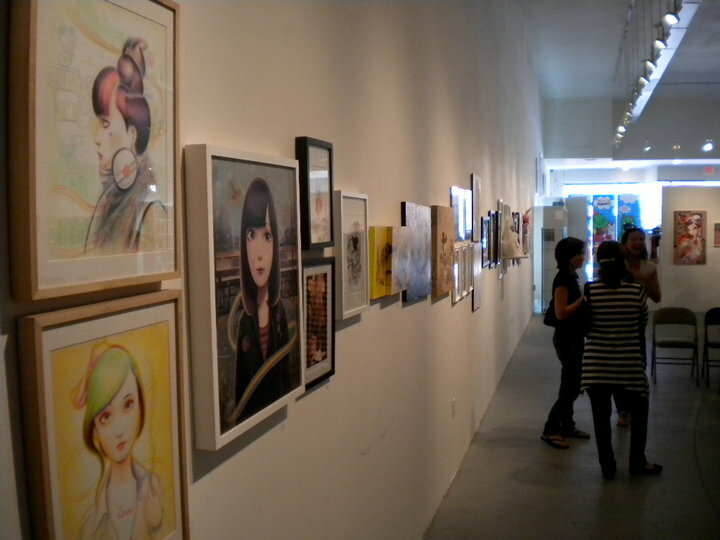 From all the signs, tidbits and photographs floating around the web, the Sweet Streets II show curated by Caro seems like it was a huge success. 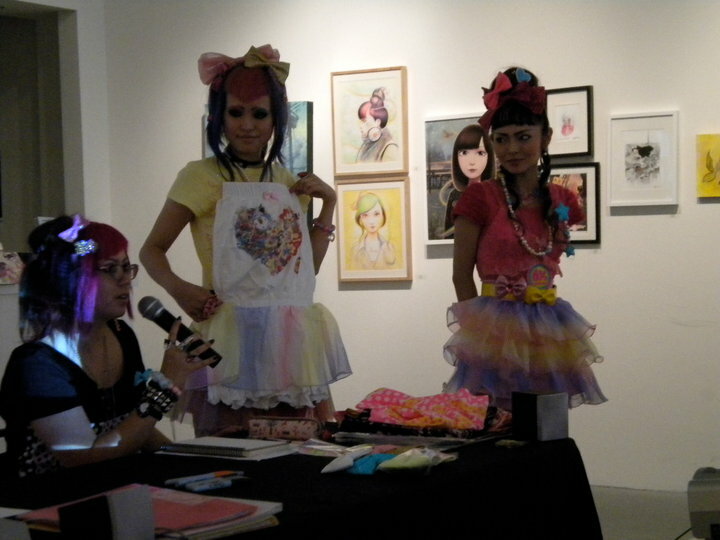 Nucleus Gallery was inundated with neon lolitas and creatures with bling bling nails, jewels and cute sparkles. Truly I missed out, especially since I have been craving some Japanese HarajukuYoyogiShibuyaShinjukuAkihabara something, anything, since I moved from Japan to Barcelona two years ago. Here is good too, but on the fashion side the Barcelonistas seem to prefer either dark, scruffy, mullet inspired looks ( I kid you not, I could write an entire post on the Barcelona Mullet) or the vintage hipster vibe. Neither of which is bad, just, I miss the day glow and cute overload of Tokyo. Well, there was plenty of eye candy on display in Alhambra on the 11th of September. I shall continue to live vicariously through the lenses of all the luckies who got to go to the exhibition. Here are a few snaps sneaked from various online sources. 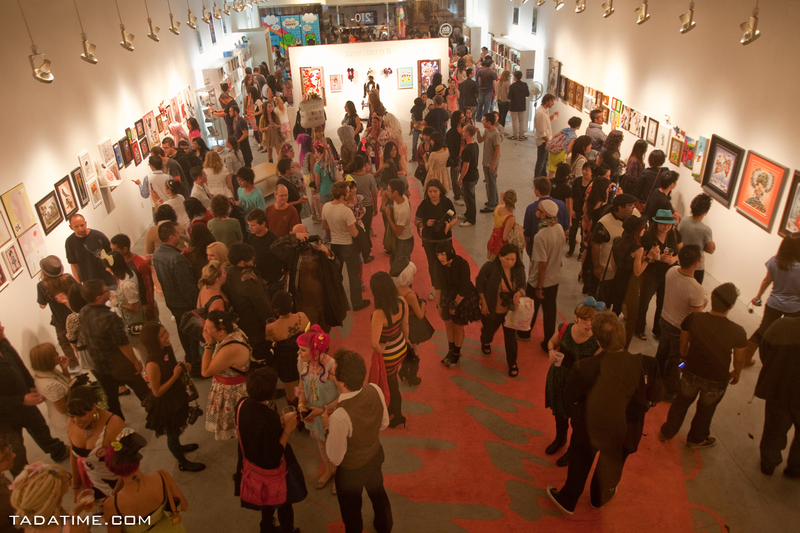 There was a huge selection of fantastic artists showing works, and it’s been a real pleasure to connect with some of them while the show came together. 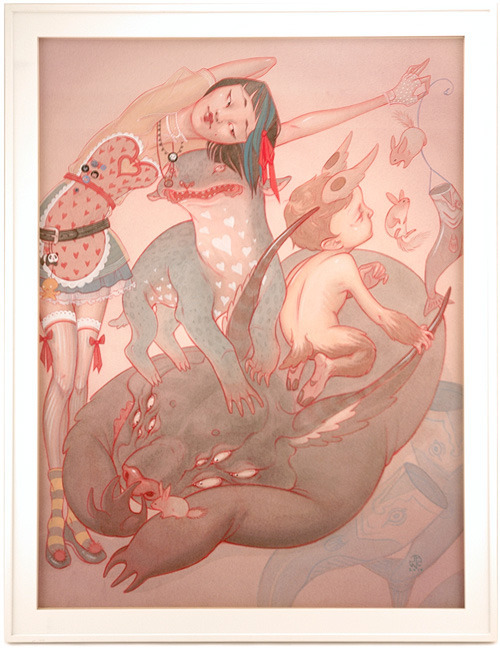 I was especially entranced by work of Jaw Cooper, who creates wonderful fantasies that are reminiscent of Studio Ghibli movies, her creatures are just too cool. If you happen to be in the LA area I urge you to drop by Nucleus Gallery and check the show out, it runs until October the 4th. It’s truly a must see, with art by Fawn Gehweiler, Naoshi, my friends Mijn Schatje, and Andrea Innocent, Stella Im Hultberg, Amy Sol, Daniel Lim, Yuta Onoda, Kukula, Ueno Yosuke, and the list just goes on, pretty awesome indeed! I loved these photographs by Dave Tada. Go and have a look at the rest of his set up on flickr. In the picture by Supa Cute above you can see a teeny bit of my pieces next to the beautiful work of Daniel Lim the artist behind Fawn Fruits. 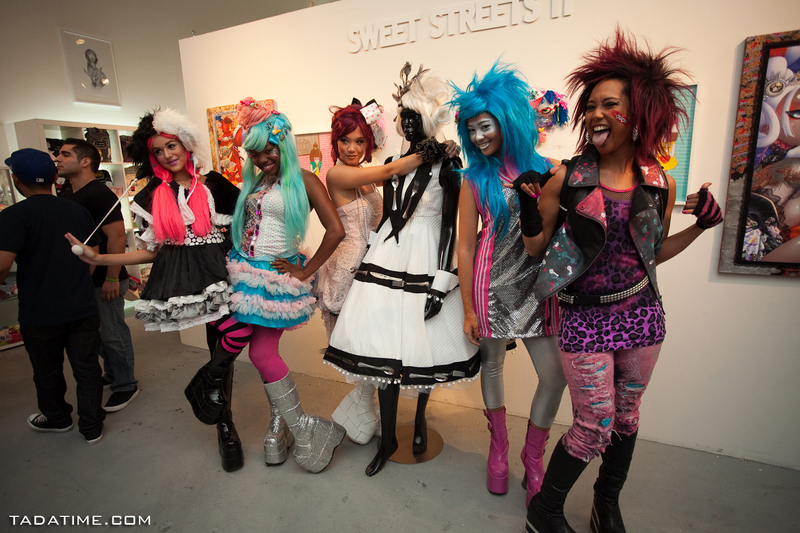 The whole event was inspired by the street fashion culture of Japan, and the guests really went all out in their attire. There was also a fashion show and the video below by Onch Movement really captures the crazy fun times everyone had, aaah, just look at all those yummy snacks. Sweet Streets II was certainly sweet in more ways than one! As a contributing artist we were asked to create work inspired by the street fashion blog TokyoFashion’s photographs of the kids in Japan, I was really taken with the new forest Mori style where everyone wears natural type outfits that are layered in white. I loved the soft tones and hippiesque moments of these clothes. I want to wear something like that in the mountains among the toadstools, somewhere like here. They were just so beautiful. My use of the owls and the white layered dress in Fukurou Fright is reminiscent of moments I have spent in wild forests and combined with the frenzy that was the heart of Shinkuku. A meshing of nature and neon. That was certainly the fashion that inspired Fukurou Fright. 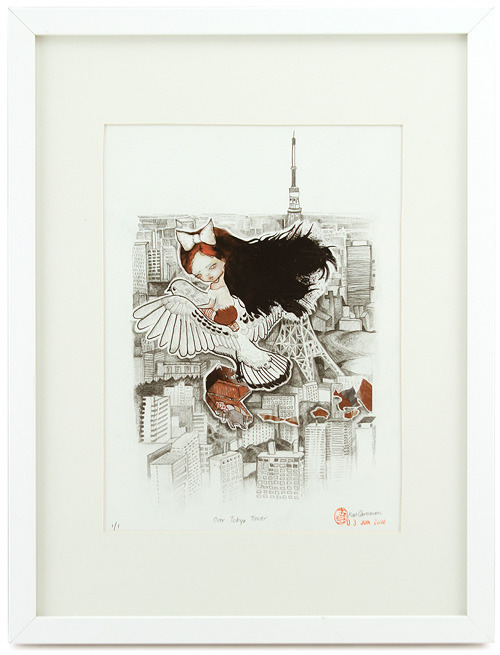 One of my artworks is already sold, whoop whoop, but the other two are still available. You can purchase them from the gallery and online. 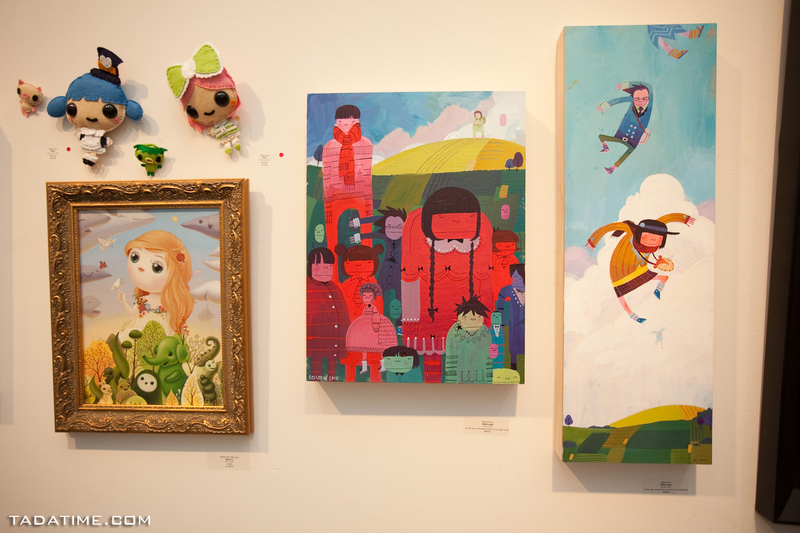 Tags: art, caro, dave tada, exhibition, fashion, illustration, Japan, kawaii, nucleus gallery, onch movement, photography, sweet streets. Bookmark the permalink. aww, next time I hope! I loved your work! It was a pleasure showing with you! Thanks cooper! I think the show went pretty well from all reports, it looked like fun! I hope you sell your work its truly lovely! I shall save some dollars to buy an artwork from you, they are gorgeous! Wow Kitty, what a delicious visual treat! Thank you!